Successfully Added SOLLED LED Touch Sensor Table Night Light Bedside Lamp Dimmable Warm White Light 256 RGB Color to your Shopping Cart. SOFT WARM WHITE LIGHT: There are 3-level warm white brightness. 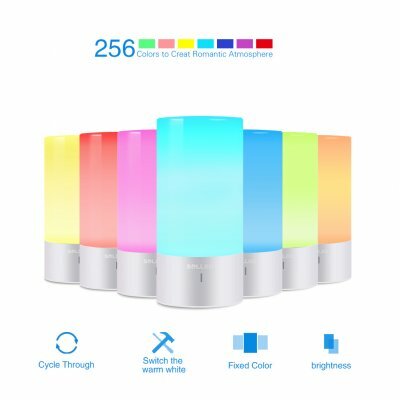 You can customize your light brightness according to different occasions. TOUCH SENSOR ACTIVATED: A 360°touch sensor control panel made of aluminum alloy allow to operate it easily and instantly. A simply touch on the metal panel can switch the light color or adjust the brightness. MODERN DESIGN: Not only a lamp but also a decoration that live the desk, stand, and any furniture up with its stylish design. LOW POWER CONSUMPTION AND HIGH QUALITY: White LED light only consume 6W, and RGB light only consume 3W. The working time up to 35,000 hours. More, this light is CE, FCC and RoHS certificated. A magic table lamp, use for reading, creating atmosphere, or take is as a night light. Operating on touch sensor, control by simply pressing the silver metal base. Fast touch the panel, then the light illuminates warm white light with three different brightness for all use. Fast touch again, the light will change the brightness from low, medium to high. Long press the panel for about 3 seconds. The light will start to cycle through a beautiful and endless color display. Fast touch the panel to fix one color that you prefer when the light are cycling. It is a bedside light but really can be used in any area of home as its stylish look. The light is CE, FCC, RoHS certificated. Very safe to use.